As my planning for other Carnivals takes center stage, Trinidad is fading as a distant memory. Moments from the fetes I attended flutter through my mind occasionally and I remember the indescribable time so had. I returned to a few I had attended last year, but didn’t want to completely repeat my experience, so I tried to diversify my lineup a little bit. Unfortunately, I lost my phone, and was not able to recover my pictures from the first few fetes I attended. Womp. The Best Of It: It was a decent event. We started off at the back of the venue and eventually made it to the front. As expected, it was far more entertaining at the front near the stage and more crowded, however I did not get into the groove of the fete. The punchy punch shots they gave out were great though, and did help to raise my dwindling energy. Machel Montano and Skinny Fabulous performed, but I didn’t even stay long enough for Ashanti’s cameo or for Kes the Band. The Worst Of It: Getting into the party was not a smooth process – entrance lines were separated by physical tickets versus electronic tickets. There should definitely have been more than one ticket scanner. I didn’t really catch a vibe throughout the fete. It was overcrowded so I was uncomfortable, squeezed between sweaty people. I am not sure who the DJs were, but their sets were not the best. I could have skipped this party. Will I go back? Unlikely. The Best Of It: I always appreciate Caesar’s Army’s attention to their patrons’ opinions. They tried something new last year by making A.M. Beach a pool party. While great, I am glad they received the feedback and took it back to the beach. The vibes were on 100! I was pretty tired but there is something about beach parties, rising with the sun while you’re drunk and seeing all your friends that brings the wotlessness out. The performance by Kes the Band was fantastic as usual, and Nadia Batson and Teddyson John also graced the stage. The drinks were flowing and the music was amazing. Frolicking at the beach at the end of the party was much needed, accompanied by entertainment by the riddim section. I also hopped across further down the beach to get some acclaimed bake and shark from Richard’s. So delicious. Overall, it was a great time. The Worst Of It: The food lines were outrageous! I did not get a single plate or snack. That was disappointing because I DID pay for an all-inclusive experience. The bathroom situation was also terrible. I know porta-potties are just gross in general, but this was on another level. They also did not have a good ratio for the number of patrons. They had mirrors and other things to freshen up, but when I was done, my goal was to hightail out of there. I did not want to hang around at all. Will I Go Back? Yes, as long as it’s on the beach. The Best of It: If there is anything about this fete that stands out far above the rest, it is THE FOOD. There was an array of premium, tasty dishes – local cuisine as well as international (Indian, Italian, Japanese etc.) I had doubles, crab legs, lamb shanks, grilled chicken, shrimp, rice etc. There was also sushi and ice cream, Henny-infused coconuts, puncheon snowcones, fresh fruit, and waitresses enticing you with shots. I went back for food two, three…I am sure a fourth time too. Some dishes ran out but there was always food. I also loved the location of the event. I had been to UPick TT Farm last year for Sunrise, but they expanded the space for this event, and it looked wonderful. The drinks were also flowing. I happily drank a bottle’s worth of Moët champagne. The Worst of It: The party is stush. I felt like I was standing around the entire time. Yes, I was eating my weight in food and drinking to my heart’s content, but I kept thinking to myself, when are people going to loosen up?! It probably did not help that the music was disjointed, and whoever was behind the mic was not very hype. Things turned up slightly when the sun went down but this was during specific moments or songs. Will I go back? It was a good experience to have but I am in no rush to return. But man, that food was GOOD though. The Best Of It: Listen. I was set to arrive in Trinidad late Friday evening but the thought of missing out on Sunrise was too depressing to bear. Guess who flew in two days early! I LOVE THIS FETE. This was the second year in Trinidad and I was not disappointed. The amazing reviews from last year definitely led to greater interest, hence more patrons, and the organizers certainly took heed. The new location was spread out and gorgeous. On entry, we received our souvenir cups and fans, a shot of Patron, and a Screwdriver. The recognizable Sunrise decal was perfect for our photo ops. After our pictures, I went straight to the food – delicious as usual, and plenty of it! I had mainly Jamaican dishes – jerk everything, rice, curry goat, festival, callaloo. There was way more food this year and a greater variety of dishes. The lines were not long and the portions were good. It was so fun – everyone was happy and having a wonderful time. We stayed mostly in a cool, elevated area that was nestled right underneath a tree, and, in my opinion, it was the best spot. Patrick (The Original Hypeman) was fantastic and the music selection was varied. No one will ever convince me that soca and dancehall don’t complement each other at a fete. I was having a time! There were a few surprise perfomances that had not been announced in advance – Machel Montano (with Ashanti), Shal Marshall & Problem Child. The Worst Of It: I wanted a parasol as a souvenir, but they gave them out to later patrons. By the time I inquired about getting one, they had run out of them. No big deal. Other than that, the event was near flawless for me. Will I Go Back? Absolutely. Take my money! The Best Of It: Paint, Powder, Water! We now start to parteeee. It was a decent fete. I had fun with my group of friends and it was a highlight dancing with Motto. Arriving at the location and the coordination to get to the trucks was much smoother this year. The drink trucks were easier to reach as well, and I enjoyed chipping with my friends. I really liked the gear we got in our bags. I found it interesting that Caesar’s Army utilized a ticket system this year instead of a wristband (We still got a wristband at entry). They also gave cool all-in-one-ski masks/bandanna/neck scarf, as well as goggles that matched the theme perfectly. Instead of their flimsy plastic cups, we got a proper cup with a handle and cover that twisted open and shut. This diminished the amount of paint and powder that inevitably gets into the cup. The Worst of It: There was more negative than positive, even with the changes. I think A.M. Bush in Trinidad has simply become too big, therefore harder to control and ensure an experience that satisfies the masses. I had an “okay” time and couldn’t really get into it as much. Weather played a role – it was damp and cold. I also felt like there wasn’t enough paint and powder this year. Definitely more powder than paint. There was no mud (or maybe I missed it?). And I could feel the impact of the water shortage in Trinidad because the hose wasn’t as free-flowing as last year. Because it was on a race track this year, there were more consistent turns, so trying to make way for the trucks and the constant herding of the crowds of people interrupted the flow. The food was terrible. What vendor do they use? Food at A.M. Bush is consistently poor. Ironically, it’s the fete where sustenance is most needed. That walking is no joke. We also left late. We were still standing around waiting for the trucks to get going close to 5am. Will I Go Back? Now that I have done A.M. Bush in Trinidad twice, I think I’m ready to spread my wings and try another fete. The Best Of It: EVERYTHING! Don’t @ me. The theme this year was “The 1970s” and it was so well-executed! Kudos to the production team. If you are seeking a traditional-style dance fete, this is not the event for you. Soca Brainwash has certainly grown into its purpose and objective – an unforgettable experience beyond a fete; a festival. The large venue - with tons of food, huge bars and all sorts of photo ops - was full of hidden surprises, grandiose 1970’s décor and fun for all. On entry, we got signature cups that had popular 1970’s taglines and catchphrases, as well as flower crowns and John Lennon sunglasses. Did you want to hang out in the shade and enjoy the fete from a distance? You had that option –there were masseuses at hand giving shoulder and foot massages. I think I saw a couple of magazines too if you just wanted to read. Did you want to be where the action is? The gigantic disco ball was calling your name. The “dancefloor” was lit all day and night. I got a refreshing coconut from the coconut station; just 10 minutes earlier, I stood in line for a guava puncheon snow cone (amazing!) and lingered for a little while at the smaller stage area where old school soca music was being played. Finally, I found my way to the front of the main stage and the vibes were electric! The DJs definitely gave their best. There was a 15 minute segment with classic 1970s pop and R&B. It was so much fun! The Worst of It: My phone was stolen minutes before I was ready to leave the party. That ruined the rest of the evening for me. I spent an hour plus combing the dancing feet of patrons trying to see whether I dropped it somewhere, more time tracking down the lost and found area with other victims, more time after that trying to track down the police station, and even more time after that trying to get out of the parking lot after all hope was lost. I was pissed and devastated, and I learned so many hard (but clearly necessary) lessons that night. Another thing that I am surprised Ryan and other all-inclusive fetes have not figured out yet are WiFi stations and phone charging stations. For such a large venue as this, it would be great to invest in several Digicel WiFi hotspots throughout the venue in order to find friends. Will I Go Back? Definitely! 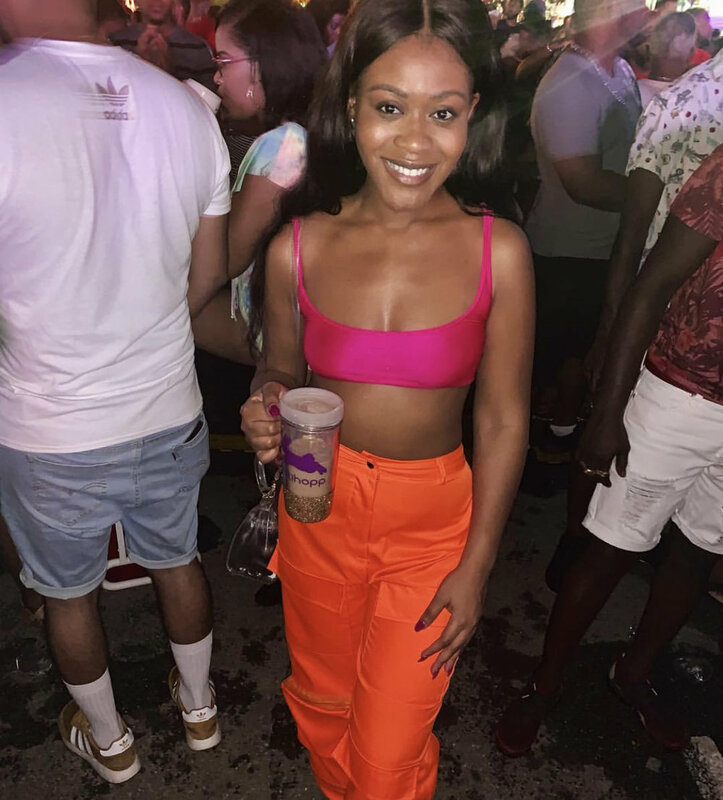 The Best Of It: Stush fete turned wet fete! We arrived kind of late – around 7am - and they had run out of cups and other souvenirs. I expected it so I wasn’t too pressed. The cups did look nice though. We headed straight to the food area. After my experiences at Sunrise, Beachhouse and Soca Brainwash, I had come to expect more food options so I was a little disappointed about the minimal variety. Regardless, it was delicious. I would have had more, but the lines were really long. The bars were a little difficult to get to, so we hung around the Remy Martin bar and champagne station for the duration of the time. Once my belly was full and I was well on my way to tipsy, it was time to party! The closer we got to the stage, the less behavior patrons exhibited. Someone, please do some research on this correlation – I witnessed this at every fete haha. The water hose made things 1000 times better! Mr Killa performed and his set was…killer. You know a live set is really good when most people are not only standing around watching, but dancing and participating as well. We were running wid it, partying bad and rollypollying in our little sections. Skinny Fabulous also performed briefly. I was sad to leave the fete a bit prematurely, but we had a cruise to get ready for. I will add that getting out of the party was easy. It helped that we left early and did not park in the main parking lot. The Worst of It: The venue is small in my opinion. I may just be used to the wide, open spaces at other breakfast parties, but everything seemed cramped. I felt it most at the food area. The food lines were bad and stretched out so far, they started to encroach on the partying space. They ran out of ice cream early. The absolute worst was the Hennessy-infused coconut water bar. I was engaged in a battle of elbows and harsh words just to get my little coconut with a Henny nip. The 4 policemen called to the scene were of no use in managing the situation. In the future, I hope they have security officers or line managers who can help bring order. Lastly, I expected more from a celebration of 25 years in the business. It’s a HUGE milestone that an event like this still exists, AND for it to still be a popular one. I have not attended in the past so perhaps others can tell me if there was any extra bit of special this year? It did not seem like it. Will I Go Back? Maybe. There are so many great events on Carnival Sunday morning, so I will be willing to try another fete. The Best Of It: This was one of my highly anticipated fetes. I had such a great time in Jamaica, I had to attend the original Trinidad version. I had an AMAZING time! To be honest, I don’t remember everything because I was lit 🥴 As soon as we boarded the boat, it was positive vibes. The cups - actually fancy water bottles - we received were of really good quality and the bar was fully stocked. I had two plates of food. The music was on point the entire time and Skinny Fabulous and Wuss Ways performed. You know a fete is lit when you don’t even care about the performance on the deck. I saw Skinny perform but I was not in the mood to venture back out when Lil’ Natty & Thunda took the stage. We were partying with Usain Bolt downstairs. Time seemed to zoom by, and before I knew it, we were back on land, trying to maintain our balance. Candy Coated, I will be back. The Worst Of It: The boarding process could have been smoother. The light rain that started mid-boarding did not help as everyone was trying to rush to the tents. This added confusion and people became a bit more aggressive. As with most boat parties, we did not board nor leave on time. Will I Go Back? Yessssssss. No question. The Best Of It: I lost my soul at j’ouvert and I don’t want it back. I had a time and a half. I was so dirty and I LOVED it! We got there a little late because of traffic but as soon as we arrived, it was go time. I loved that there were several paint cars/trucks/buses and you could just grab paint at your leisure. I don’t understand j’ouverts that ration paint like it’s a famine. Is it not the point of j’ouvert?! The Red Ants team was super interactive with patrons - throwing powder, throwing mud, rubbing arms and faces with paint etc. I had so many drinks, I surprised myself. It was VERY easy to get drinks. There were multiple drink trucks and they had my drink of choice for the night/morning. Johnnie and ginger ale. I was downing them like I just left a desert, honey. The DJs were great! I think we stuck with trucks #2 & #3 for the most part. It was lit from start to finish! Kevin Crown gets a special shout out. Shelllllll. The icing on the cake was chipping in the Socadrome and crossing the stage while a Machel Montano performed. It was amazing. The Worst of It: I could have done with more food. We got two food chits, which I used on delicious doubles. But with all the walking and alcohol I drank, I needed more food. Walking back to our car from the Socadrome was the worst! We were dead tired and had to soldier on as I rushed to get to the car so I could get ready for my makeup appointment. Lastly, going to the bathroom during j’ouvert is always an uncomfortable experience. This was no different. Squat, sis. Aside from the j’ouvert experience, Red Ants needs to modernize their registration process! There is no reason why in 2019 registration is not electronic. We shouldn’t have to be chasing down a committee member to pay in cash. Will I Go Back? If I do j’ouvert again, it will be with Red Ants. This is a wrap for Trinidad Carnival 2019. My experience was far better than last year. Fetes in Trinidad are seriously on another level. I had an amaaaazing time! What were your favorite fetes during Trinidad Carnival 2019? Which were the worst? Sound off below! Also, download the Carnivalist app and share your reviews for future patrons. Let’s help each other out and keep promoters/event coordinators accountable!